Danielle Campbell of Cablevision's News12 Long Island has profiled the 1937 Chrysler's Chrysler in a Long Island's Hidden Past segment. KINGS POINT - There's no shortage of auto shows this time of year on Long Island, but many haven't seen Walter P. Chrysler's very own Chrysler! The discovery of the vintage car - and its restoration - is part of Long Island's Hidden Past. The custom built limo from Long Island's Gold Coast era belonged to automobile titan Walter P. Chrysler, who lived in Kings Point. The sleek black limo was built in 1937 to Chrysler's specifications. The car is a one of a kind. But for decades Chrysler's Lux Limo was lost. 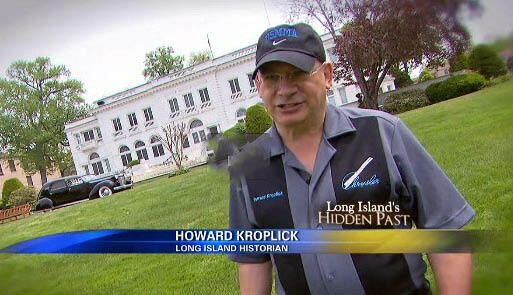 Long Island historian Howard Kroplick found it tarped over and forgotten in a garage in Centerport. Kroplick bought the car and meticulously restored it to its yesteryear grandeur. The car was a gift from Chrysler to his wife Della, and it is fitted with all the luxuries that a woman would love. It also had advanced technology - the chauffer would just pull up on the handle and the car gets locked and the window goes up like magic.